Putin’s New Generation - CEPA STRATCOM PROGRAM. The outcome of Russia’s 2018 “election” did not come as a surprise. In typical Kremlin fashion, the performance was realistically staged, with a few interesting plot twists, and the appearance of “choice.” One element that the Kremlin could not fully control, however, was the rise in grassroots opposition to the Kremlin’s political machine, particularly among Russia's youth. What does this growing trend spell for the future of those in power in the Kremlin and how should the West view Russia's rising generation? 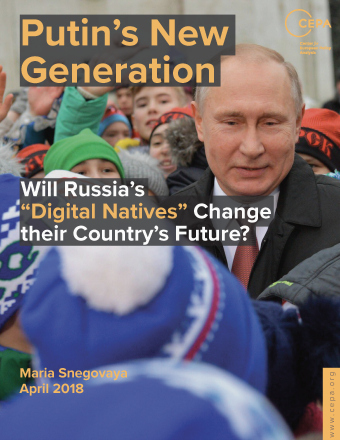 In the second installment of a three-part analytical series on Russia, the Center for European Policy Analysis (CEPA) publishes its latest brief on “Putin's New Generation: Will Russia's 'digital natives' change their country's future?” In it, Adjunct Fellow Maria Snegovaya tackles critical questions about this cohort. Those born since 1993 and sometimes called Generation Z or “Putin’s generation” have largely known political life only under the current Russian president. Since many of them are actively joining opposition protests, this crucial demographic could hold the key to Russia’s political development. Yet they also are one of the least understood groups in Russian society. Who comprises Generation Z, what do they want, and what do they fear? Snegovaya finds that the Kremlin may become increasingly estranged from the younger generation’s desire for openness and change, and if left unaddressed, today’s youth could in time become a potent threat to the Kremlin’s hold on power.